Adrianna Alvarez (’14), the Pioneer’s fall 2013 News Editor and before that the Pioneer’s Assistant News Editor and a Staff Reporter, has recently graduated with her second master’s degree. She works for a hospital doing exceptions and insurance work. She also edits papers and helps students write college entrance papers. Her hope is to eventually work for a high school or university with first generation, low-income students on their college entrance papers. 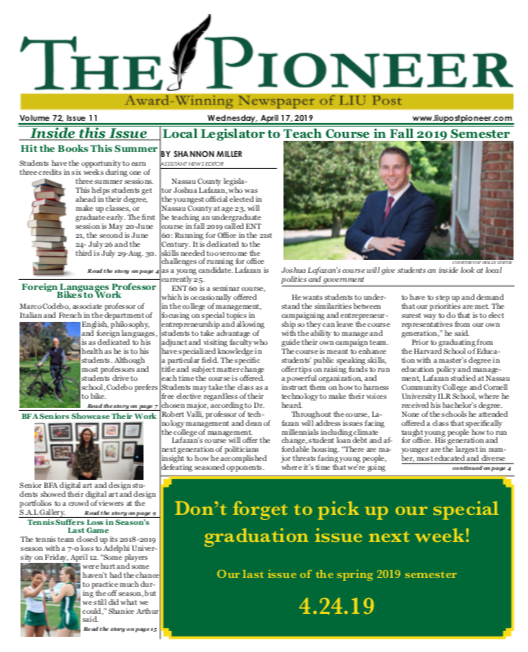 At LIU Post, Adrianna was the recipient of a first place award from the Press Club of Long Island in the “Student Journalism – Narrative – College News Story” category in June 2014.